Beatrice it´s a great profesional. Push the doors of a typical Basque villa, welcoming and convivial. A house in which our teams will share their good personalized plans for the region and do everything possible to make you feel at home. Only 100m from the beach at Hendaye, and with many rambling and hiking paths that start from here, you are offered a dip into the spirit of South-western France with a hotel or a holiday rental on the Atlantic Coast. Outdoor swimming pool, restaurant opening on to the terrace, a sea view – everything to help you relax. Numerous delightful excursions are on offer, either independently or with a guide, with an historic or craft theme, a little trip to the nearby Serge Blanco thalassotherapy complex, water sports and sailing – it’s your choice! This family home breathes the Basque Country to the end of the wood panelling. Architecture, colours, interior decoration... up to its name Orhoïtza, which means "Remembrance". With its predominantly passion red, like the Basque Country chilli peppers, this charming hotel sets the tone for a colourful holiday. A warm and friendly atmosphere in this delightful family residence that breathes the Basque Country. Regardless of the package you choose, the atmosphere is convivial, the evening pre-dinner drink accompanied by traditional tapas snacks. There are guided excursions in France or in nearby Spain, starting from the hotel, plenty of interesting walks and evening entertainment. This magnificent holiday residence, based on a large family home, is typical of the Basque Country in the decorative woodwork of the frontage. The architecture and interior decoration is authentic and traditional with red wooden mouldings on a white background as is the name ‘Orhoitza’, which means “memory” in the Basque language. You have the choice of a hotel room or an apartment at the residence in Hendaye. 42 rooms elegantly decorated and only 100 m from the beach at Hendaye all with balcony or terrace. This package enables you to enjoy a family holiday in complete freedom, at your own pace, benefitting from a comfortable holiday let arranged for staying with children. You will also be able to enjoy some of the hotel’s additional services if you wish, such as activities, entertainment, cultural events, eating in the restaurant or getting takeaway food. The small holiday accommodation is only 50 m from the hotel and has a view over the marina. It consists of 10 apartments, ranging from a two-person studio flat to a four-room flat for eight people. Sheets, cleaning kit, towels and household linen, dishwasher, TV, telephone, telephone, oven, microwave, dishwasher. Comfort formula: beds made on arrival, change of towels on request and cleaning at the end of stay: 12€/studio at 18€/2 rooms and +. “Les trois couronnes”, the restaurant in your hotel at Hendaye is on the garden level and opens on to a very handsome terrace. The cuisine on offer is carefully prepared and redolent with the flavours of the Basque Country. In summer, you can eat on the terrace for greater enjoyment of your holiday. The hotel’s wine list is also varied with the finest vintages of our regions. Discover here our page dedicated to the terroir to discover all its charms. The all-you-can-eat buffet breakfast offers you a wide range of fare, including hot or cold drinks, dairy products, cereals and naturally, a choice of various breads, not forgetting local specialities to vary the pleasures throughout your holiday stay. If you want to taste Basque food in complete tranquillity, room service is available so that you can enjoy your room while regaling your tastebuds. Breakfast 7.30 a.m. – 10 a.m. Lunch Midday – 1.30 p.m.
A la carte: salad, duck breast, etc. Dinner 7.00 p.m. – 9 p.m. The bar offers drinks or cocktails continuously from 8.00 a.m. to 10.00 p.m.
For the holiday lets on the Atlantic Coast, the hotel bar welcomes you to enjoy our variety of cocktails with friends during your hotel stay. You will also enjoy our pre-dinner drinks with tapas several times a week (from April to late October). 3 animated evenings per week (excluding summer). 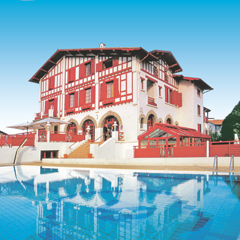 The Serge Blanco thalassotherapy centre is only 300 m from your holiday home in Hendaye or from the hotel. It is a totally renovated modern complex which welcomes you with its clean, mineral decor and pampering ambiance. Everything is peaceful and tranquil here enabling you to dive into the delightful beauty treatments based on natural products. It is up to you to choose whether you want a day package or a slimming cure. The complete infrastructure that has recently been entirely renovated. Genuine thalassotherapy and wellness formula. 3 hydrotherapy treatments 2 hours access to fitness areas. Over 5 days: 3 seaweed wraps or sea mud applications, 2 relaxing massages, 10 hydrotherapy treatments. Over 6 days: medical check-up to be paid on site. Multi jets baths, jet shower, affusion shower, mud wrap and massage/modelage alternately 1 day out of 2, pressotherapy, manuluvee/pediluve, aquagym, lymphatic drainage. The packages are to be booked at the registration, other packages are proposed on site. Rates without accommodation, Relais Thalasso Serge Blanco. Discover and visit the Basque villages & Spain nearby! The Basque Country: spending a holiday in Hendaye offers a glimpse of the pleasures of the Iberian peninsula. Hendaye’s charm derives from its magnificent beach, ideal for fully benefitting from what the sea has to offer. The Golf Country: less than 40 km away, you will find more than 10 golf courses, including the eighteen-hole Makila Golf Club at Bassussary near Bayonne and Biarritz. It is possible to reserve a game in advance. The carnival and Biarritz music festivals (March).. The Ham Fair (April) and Chocolate Days in Bayonne (May). The Spring Fair at Hélette. Fontarrabie opposite Hendaye on the Bidassoa, access by shuttle boat*, San Sebastian access via the "topo"* at Hendaye station, Bilbao and the Guggenheim Museum. A walk in the Basque mountains, to discover a fabulous panorama and cross many pottoks in freedom (Pony breed of the Basque Country). March: International flm festival of the sea. May: May from the Theatre in Hendaye, the Chocolate Days in Bayonne. September: Corniche festival, sales and themed visits. Golf: about ten golf courses in the region. A small rack-and-pinion train takes you in 35 minutes to discover splendid panoramas, on the peaks of the Pyrenean chain, along the Atlantic Ocean from San Sebastian to Biarritz. Visit the villages of Ainhoa and Espelette, typical of the Basque coast and taste the local Basque specialities (cheeses, lambs, chili peppers, wines, hams, fish, cakes...), without forgetting the specialities cooked with plancha for the happiness of your taste buds. The Château d'Abbadie and its estate: This handsome building fronts the ocean and bears the hallmarks of the passion for oriental artefacts of its owner (Antoine d'Abbadie, 1810 - 1897). Great walks through the park that overlooks the ocean on three sides. The Basque Museum, in the historic centre of Bayonne, is the largest ethnographic museum in the BasqueCountry. It contains 2000 objects and works of art, collected since 1922 and exhibited in nearly 20 rooms, evidence of the Basque identity, the way the society operates, its traditions and the role of the port of Bayonne in the nineteenth century. This is more than a visit, it is a journey of discovery. Large exhibition rooms into which the light filters mysteriously making the visit into an intriguing voyage of discovery, the visitor being an attentive and curious explorer. More than 150 species of fish and invertebrates are displayed in magnificently realistic, brilliant settings. There is a seal basin, in which the seals can be seen from under water – the seals are red every day at 10.30 a.m. and 5.00 p.m. There is also the shark grotto, where you will find yourself nose to nose with shark of various species. The collections include cetaceans, birds, fishing, ethnography, oceanography, meteorology and more. There are interactive screens, dioramas, videos and more. Experience the Basque Country in one hour in a “son et lumière” light-and-sound show at Saint-Jean de Luz. An unforgettable experience. Discover Basque Culture and Traditions at an exceptional site. It will take your through history with reconstructions, scenes and games. The Park and the Castle are at Urrugne 3 km from Saint Jean de Luz. This fortified castle has been in the same family since it was built in 1341. It was enlarged in the sixteenth and eighteenth centuries and is now a very welcoming Historic Monument, elegantly furnished and decorated. The stones of Urtubie tell of sixcenturies of the history of the Basque Country. King Louis XI stayed here in 1463 and Louis XIV elevated the estate to a viscounty in 1654. In the nineteenth century, Marshal General Jean-de-Dieu Soult, First Duke of Dalmatia, followed by Arthur Wellesley, First Duke of Wellington passed through here on their way to fight in the Napoleonic Wars. The château’s position only three kilometres from Saint-Jean-de-Luz and nine kilometres from Spain make it a special place whose charm and historic tradition make it well worth a visit. Discover the origins and mythology of the Basque people! In a unique natural site, these prehistoric caves are different. Cross the magnificent portal, climb the great winding path and see the galleries covered in calcite, to discover the Mythology and Origins of the Basque People. It is a voyage of initiation in “son et lumière” (light-and-sound), inspired by the writings of J.-M. de Barandiaran, one of the great anthropologists of our time. A newly refurbished attraction that will take you from reality to myth. This manor house with its dependencies retraces the living conditions and daily life in the country in this part of the Landes region. During the visit you can explore the outbuildings of the squire’s residence. The wine-cellars and his exceptional wine-press of the Roman type, the vine conservation project at Chalosse, the tenant-farmer’s market garden and his meticulously cultivated "square plots" and the work of the blacksmith. The bread oven operates every Wednesday. The Museum also houses exhibitions and celebrates the Fête des Vendanges (grape harvest) annually. At Cambo les Bains, a spa town, you can visit "Arnaga" home of the great French writer Edmond Rostand and its magnificent gardens in the French formal style.In 1902, the author and playwright Edmond Rostand (1868-1918) bought several hectares of land on the hill overlooking the Valley of the Arnaga where he built a house in neo-Basque style. The poet lived here with his family in this lavishly decorated house from 1906 until his death in 1918. Find out about our hotels in La Baule and Deauville as well. A63 or A64, exit no. 2 for Saint-Jean-de-Luz Sud. From Hendaye, when in Hendaye, follow the Boulevard de la Mer. At the roundabout at which there is an old casino built in Moorish style, continue straight for about 500 m. Turn left when you get to the Rue des Arbousiers, continue straight until you reach the Floride roundabout, then take the fifth turning to the left to 1 rue des Oliviers. Biarritz Parme Airport is about 25 km away. Hendaye station is 3 km away. City tax: rate determined per person and per night, liable to be reviewed during the year depending on municipal regulations. Pets allowed in the holiday lets as long as this is stated at the time of booking (8€/night in holiday rental, 14€/night in hotel). Pets accepted as long as ths is stated at the time of booking, acceptance of the rules of hygiene and veterinary provisions (please bring an up-to-date vaccination booklet). No animals allowed in the common parts and beside the pool. Pets must be kept on a lead throughout the property. No dangerous pets (categories 1, 2 and NAC) accepted. Deposit € 250 per rental. HALF-BOARD PACKAGE: Half-board accommodation (breakfast + dinner). RENTAL PACKAGE: Accommodation, bed linen, towels and towels, maintenance kit, television, access to the hotel swimming pool. Options: End of stay cleaning: 49€/studio at 77€/2 rooms and + (except kitchenette) - Comfort formula: beds made on arrival, change of the towels on request and end of stay cleaning: 12€/studio at 18€/2 rooms and + - Covered and closed parking: 10€/night - Animals: 8€/night to rent. Double room occupied by one person: supplement from 16 to 28€/night depending on the season. Room with balcony or terrace: supplement of 10€/night.